When I was a sophomore in high school, one of my senior friends professed his love of Rush to me. As an eager and willing participant in pretty much anyone's rants on the state and history of music, I took his devotion seriously, though it was a mystery to me as to how Rush could possibly be an object of affection for, well, anyone. I mean, the instrumental parts were neat -- those drums never missed a beat, the guitars were as impressive as anything out there, and hey, there were synthesizers, too. At the time, synthesizers in rock music were, forgive me, way cool as far as I was concerned, and their use in songs like the ever-famous "Tom Sawyer" transfix me to this day. Still, there was a rather large sticking point: those vocals. The unique tone of Geddy Lee was the aural equivalent of a particularly pained cat to my ears, and I all but refused to listen to anything with his voice attached to it. Now, age has brought the gift of tolerance to my listening habits, and Geddy Lee no longer throws the 'pain' switch in my brain. Perhaps it is this very tolerance, conditioned over the course of many years of listening to some truly awful singers, that allows me to enjoy the music of Cranes, as well. Like Rush, one of the more distinctive features of Cranes' music is the sound that emanates from their vocalist, one Alison Shaw. It's also the feature that turns many off of Cranes. Ms. Shaw, who shares the songwriting duties of Cranes with her brother James, sounds for all the world like a five-year-old. Granted, she sounds like a five-year-old with the weariness that can only come with 30 more years than that, but her tone is a breathy whisper as filtered through a haze of helium. Like Geddy, it's not a technically bad voice -- her pitch is spot on, and she can hold a long note with the best of singers. It is, however, initially a bit off-putting, especially when applied to the mellow, eyes-half-open dreaminess of the instruments surrounding it. A few listens in, however, it quickly becomes impossible to dissociate Cranes from the voice, impossible to picture them without it. For her part, Shaw is subtly expressive as she's ever been, somehow tweaking that baby-vocal to evoke emotions as disparate as fear, sorrow, and utter bliss. 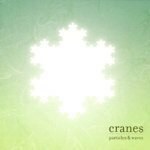 Particles and Waves as an album is a much more fitting showcase for that voice than Cranes have been prone to releasing in the past. Nothing on the entire disc gets above a dull roar, save perhaps the obtrusive, dissonant electronics that eat up the middle section of "Here Comes the Snow", an otherwise droning, distant, quiet track. The album is structured wonderfully, quietly gaining momentum as it progresses. "Vanishing Point" sounds like a stage-setter, with its quiet, floating electronics and pretty melodies (all of which eventually give way to a jangle-pop outro), but it somehow leads into something even quieter, the mesmerizing "K56", which is something akin to recent Massive Attack without the beats. The French-sung title track is actually the first thing on the disc that approaches mid-tempo, and the rolling drums actually manage to sound refreshingly quick placed halfway through the disc as they are. The latter half of the album, for its part, becomes a wonderful little pop set that seamlessly meshes quiet electronics with the traditional guitars, drums, bass, and vocals. For all of Particles and Waves' seamless construction and intelligent design, however, there's still no getting around the voice -- indeed, it's the two tracks that don't feature Alison's vocals that point this out most obviously. There's "Astronauts", which is pleasant enough while featuring no vocals at all, yet suddenly, there's nothing there to identify it as a Cranes song. More obvious is "Every Town", on which James gets to star, croaking out a vocal line in so fragile a manner that it sounds as though it could break in half at any second. "Every Town" is a solid song, but it lacks that something that makes most Cranes music something a little special. Apparently, love it or hate it, Alison's vocal is that something as often as anything else in Cranes' palette. Your own mileage will vary accordingly.